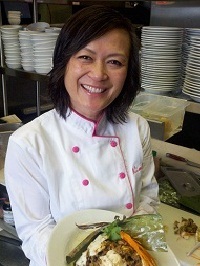 We are excited to introduce you to our June Chef of the Month, Chef Julie Herrera-Lemler! She is an prize-winning baker as well as a jack of all trades! If she is not baking, you can find her teaching baking classes, public speaking or even officiating weddings! Read below for more on our June Chef of the Month and her tips and tricks to having a successful career in baking! I was born in San Jose, CA. I have a couple favorite kitchen tools. I love Several different sized cookie scoops. These are essential for measuring just the right amount of batter for different sized cupcakes. I also need baking tips for creating different frosting looks to accompany the perfect garnish. Finally, I must have my multi kitchen timer – because a busy girl has a million things going at once. Mine has four timers on it – all with different alarm tones. My eyes. Everyone eats with their eyes first. Details and neatness matters. 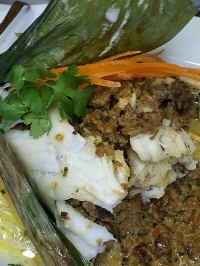 If you have a beautiful dish – that is the very first impression of what’s to come. I have a couple of things. Volunteer in a kitchen whenever you can. Get the experience of working in different kitchens with different people. Another tip is to find yourself a mentor. A good mentor (or two) will guide you on the right path. Be organized. Set everything up prior to your start and you won’t have to run around looking for things. Good food makes everyone happy. Everyone has to eat but I means something when you take the time, make it right and it turns out good/great! Color and comfort are most important. Berries. Berries are not only delicious but they are beautiful in any dish. The color of berries is like no other. My own! Rochester, MN has many new places and has become quite the culinary town in the last couple of years. Key Lime PIE Cupcakes. They are my prize winning cupcakes. It is made with a homemade pie crust at the bottom, a key lime cake, key lime cream cheese and butter frosting and a fresh raspberry on top. My father. He passed away before seeing me thrive in my elements of baking. Before he passed, he told me he liked my cooking. That has stuck with me to this day. Although he enjoyed my cooking, I know he would have enjoyed my sweet treats. My passion started with a bake sale for charity. I held it two years in a row and by the end of the second year; I discovered that I really had a passion for creating beautiful small treats. 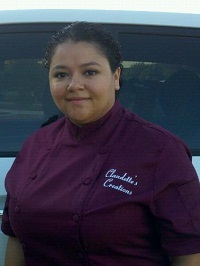 My name is Claudette, and in September of 2011, I opened my Custom Cake Business. On top of my regular clientele, I take advantage of every opportunity to donate cakes to my church, True Life Church in Universal City, TX. I also am a volunteer for Birthday Cakes 4 Free, San Antonio Chapter. They are a non-profit organization that reaches out to professional bakers to provide birthday cakes to children who, due to no fault of their own, would not normally receive a birthday cake. Most recently, I donated over $500 in baked goods to Austin Bakes for Bastrop. On October 1, 2011, this organization held one of the largest bake sales I personally had ever seen and raised over $12,000. The proceeds of this bake sale then went to The Austin Community Foundation Central Texas Wildfire Fund. I constantly use profits from my cake orders to buy supplies for my donated cakes. With the holidays coming up, I anticipate the need for my donations will be increased and the $500.00 would be a greater help than you could imagine. I have been blessed with a talent that I have never taken a class for. I am also blessed with the want to serve and bless others. Winning this contest would provide me with the means to make an even greater impact on the community as every penny would be used to provide the less fortunate with an unexpected treat. And Chef Uniforms, you could be the BIGGEST part of this, by selecting me as the winner. Thank you so much for your time and consideration. 1. How does it feel to win Cash for the Holidays? It feels so amazing, especially when I think about how many families I will be able to touch during the holidays! I work part time at a bank, where I shared my entry page with co workers as they shared with their co workers too. My husband is active duty Air Force currently deployed, and he shared with his co workers, friends and family to vote for me. And I shared the link to the contest in my Claudette’s Creations Facebook page and enticed people to vote and share. I made a little contest of my own by creating a raffle to win a gift certificate to Claudette’s Creations by voting and sharing. I would raffle it off when I hit a certain number of votes. It was never planned. I made my sister’s wedding cake; it came out nice and figured, hey, I can do this. I love the gift God has given me. I love the double button up baker’s coat. Short sleeved especially, because it gets so hot in Texas. I see a lot more health conscious options offered. I currently operate out if my home, however, I plan to one day have a store front for my cake shop, sell cake supplies, and teach cake decorating classes. I would have to say no, things have gone pretty smoothly. Congratulations again, Claudette, and thanks again to all who participated in our contest!